When a vape user wants to really get the most from their vape supplies, handling refilling their cartridges is one thing that they’ll need to do. And just as importantly, stores who fill their own cartridges with their own special blends need a way to do just that as well. That’s why we proudly offer wholesale syringes at a price anyone will appreciate. Our 1 gram glass syringe and case set includes all that is needed for refilling cartridges and reusable e cig pens. You get a clear plastic case, glass syringe, and the attachable tip needed to accurately put the juice into the vape. The high quality glass means that no off-flavors are imparted into the mixture and that users are able to get a great tasting vape every single time. And at the low wholesale price, it’s easy to stock up and make sure that your customers can afford the kits with ease. The 1 gram size is perfect for filling up practically any vape cartridge or e cig pen, too. These syringes come with a low price that makes it easy to order in bulk and enjoy greater cost savings, which in turn means that stores can cut their costs and compete with their peers – plus it means that vape users get to save their money and spend it on things like the juice they’re filling their devices with. Great, fast customer support. We’re always here to help and ensure that you get exactly what you’re looking for from every order. 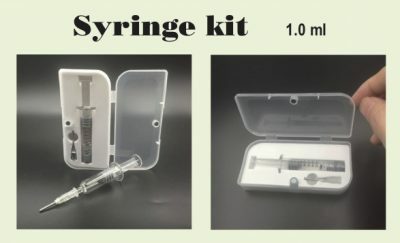 We can help you find the perfect products for any situation, and when it comes to glass syringes we take pride in making it easy for you to order wholesale syringes with confidence. With every order you’ll get the highest quality product possible and be able to stock your store shelves with it – or use it for your own personal vape pens.